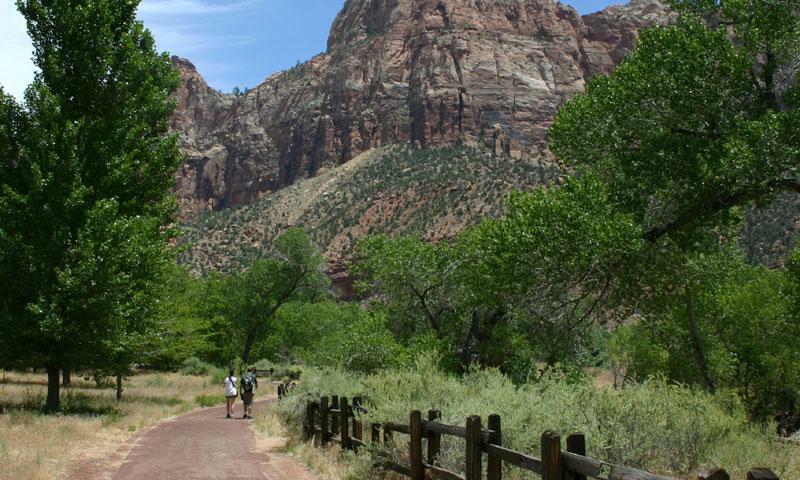 With wide pavement providing ample space on this beautiful trail along the Virgin River, the Pa'rus Trail is paradise for hikers, bikers, families with strollers, and those with special needs. Pa'rus Trail is fully accessible, rising only 50 ft. in the 3.5-mile round trip. Interpretive hikes, lead by the rangers, explain much of the flora, fauna and history. Take your pets for a trip on the only trail where they are welcome. Bicycles are permitted on the trail, avoiding shuttles on the main road. While most canyons are viewed from the rims along the top, Zion can be viewed from the canyon floor. The Pa'rus Trail provides an easy way to get out and see the canyon walls, rock formations and raging river up close and personal. The Pa'rus Trail is one of the most popular treks in the park, with the intentionally wide trails, narrowing only at a couple bridges and tight points. Visitors can stop anywhere along the trail to head back, or even take the shuttle back from Canyon Junction. Passing the Watchmen Campground, the Zion Human History Museum, and ending at the Canyon Junction after 1.7 miles, the trail follows the Virgin River in its course through the canyon. Most people complete the 3.5-mile round trip under two hours. 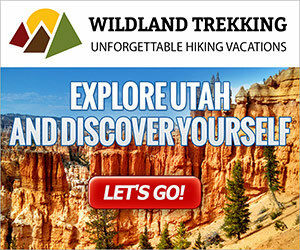 The Pa'rus Trail starts from the Zion Canyon Visitor Center and heads up to Canyon Junction, which is where the Zion-Mt. Carmel Highway meets the Zion Canyon Scenic Drive. If you have pets that would like to see (and smell) Zion for themselves, then this is the only trail where they are permitted. Leashes are required at all times. While there are three water stops along the way, visitors are advised to carry their own water because the trail is exposed to the sun and the desert climate is extremely dry. Bicycling is generally prohibited on the trails, but the Pa'rus Trail is an exception. 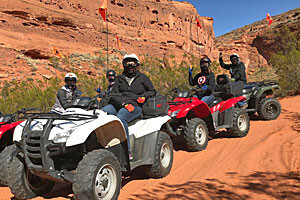 With its wide pavement and convenient bypass of the Zion Canyon Scenic Drive, this is a great route for bikers. For those requiring a trail accessible to those with special needs, the Pa'rus Trail is a great choice. Interpretive walks are lead by the rangers, and the entire trail is paved, with maximum grades of 5% and 7% in small sections. The name "Pa'rus" comes from the Paiute work meaning "bubbling, tumbling water." After seeing the Virgin River below, visitors appreciate how appropriate the name is!